Newbold is proud to be involved in the Meat Elite purchase of the top price ram at the Hillcroft Farms Poll Dorset Stud Dispaeral. HF756/13 is a structurally correct ram with excellent muscling and Lambplan figures (BWT 0.36, PWT 16.9, PEMD 3.6, C+ 223). See his full ASBVs here. We are excited to include him in our breeding program for the 2015 drop and look forward to seeing how his progeny perform. The 7th Annual Australasian Dorset Championships were held in Bendigo on September 13th - 15th. Newbold ram 94/13 placed 4th in the Lambplan Performance Ram class. 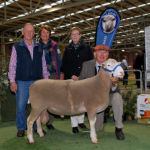 He was also awarded 2nd in the Poll Dorset Lambplan Ram class at the Royal Adelaide Show. 94/13 was sold to Bramwell Heazlewood of Melton Vale, TAS. 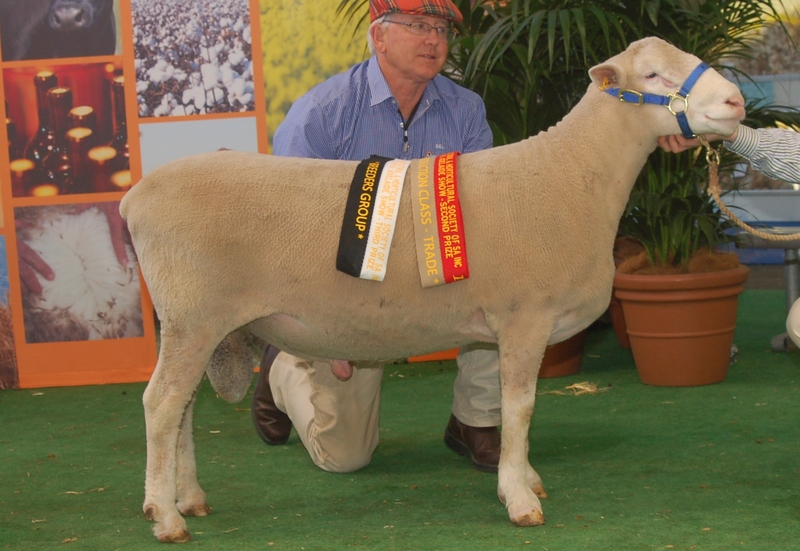 Reserve Champion Ewe - Newbold 685/13, sired by Newbold 255/10, a national top sire for eating quality. 2 seconds including Poll Dorset Lambplan Ram (Newbold 94/13 - SOLD to Melton Vale, TAS) and Poll Dorset Lambplan Production Pair - Trade. It was wonderful to celebrate 60 years since the formation of the Australian Poll Dorset Association with Poll Dorset being the feature breed at this year's Adelaide Show. We are sure that W.J. Dawkins would be very proud of the progress that has been made since over the last 60 years. 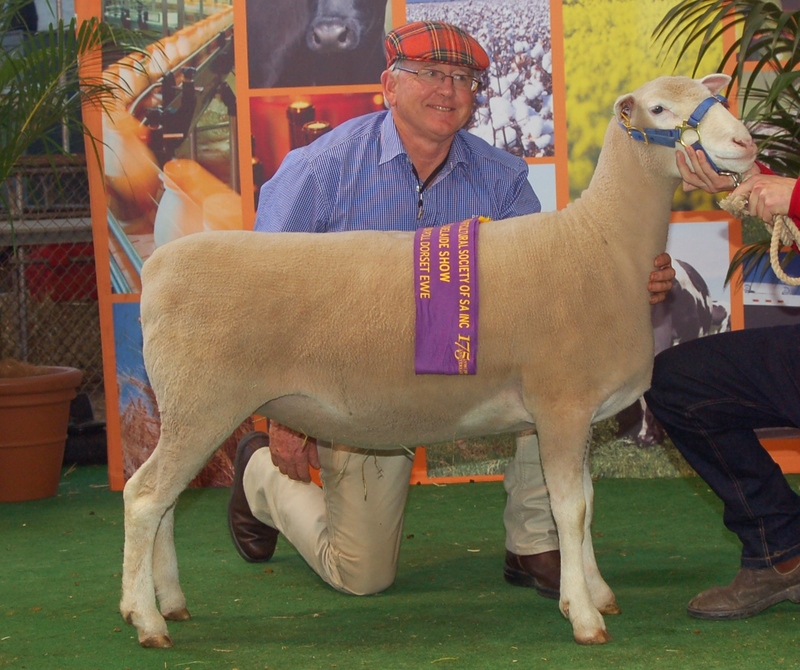 Complete Adelaide Show results can be viewed here. Thank you to all who attended our 2013 sale. Over 100 sheep were sold to a top of $4000. We were again pleased to see Newbold rams and ewes going to both regular and new clients. The number and quality of rams on offer provided buyers with both exceptional choice and value for money. With Newbold rams amongst the highest in Australia as ranked by Lambplan, we truly believe our clients purchased Australia’s best value rams. 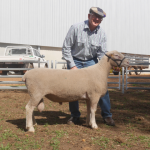 Equal top priced flock rams $1200 went to Brian & William Hurn, Angaston and TR & OA Mudge, Innamincka. Volume ram buyers included Hurns, Bill Pearce, Steve Eckert, Highland Props, Mudges and long-time client Trevor Day and sons. Top priced ram went to John Hedges from Bugle Downs for 4000. 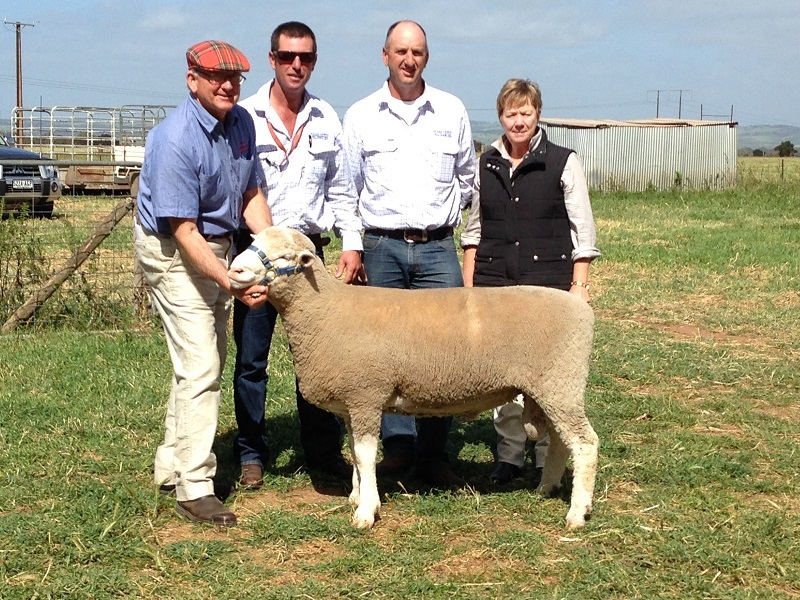 Long-time Newbold clients, Bugle Downs have a very successful ram sale at Keith every year. Save the date: Newbold 70th Annual On Property Sale September 25th 2014. First prize Lambplan Ram at Australian Dorset Championships, Newbold 65/12 sold to Wallace and Sue Binnie, Coledale Stud for $9000. His progeny are looking great and he is one of our leading AI sires this year. 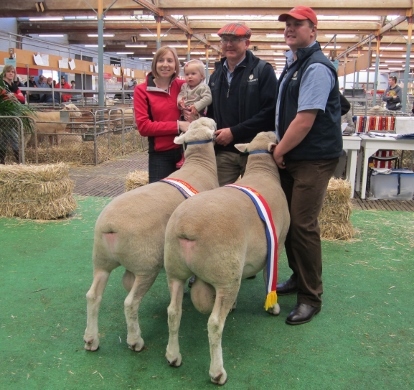 A pair of Newbold Poll Dorset rams won the prestigious Champion Interbreed Lamb Production - Terminal award at the Royal Adelaide Show. Lambplan figures are combined with visual assessments (including structure & soundness, skin value and carcase attributes) to determine the overall market suitability of the rams entered. One of the rams in this pair was purchased by Lucindale’s Morton stud while the remaining ram - Hector 100/11 - was retained by Newbold and has gone on to produce impressive progeny. He has remakable high balanced ASBVs and would be great addition to any studs AI sire team. More about "Hector".